On Friday, the ISS crew watched the test flight of NASA's Orion rocket, which was the first spacecraft since the Apollo missions to leave low earth orbit and return home. The Orion, which was an unmanned mission, was being tested as a possible means to propel astronauts into deeper-space targets such as an asteroid, or Mars. NASA has stated that it hopes to put a manned mission on Mars by the mid-2030s, but for now, our intrepid ISS astronauts remain humanity's sole spacefaring outpost. And they're great at it...Astronaut Cristoforetti, aboard for two weeks now, has already got the hang of micro-gravity. 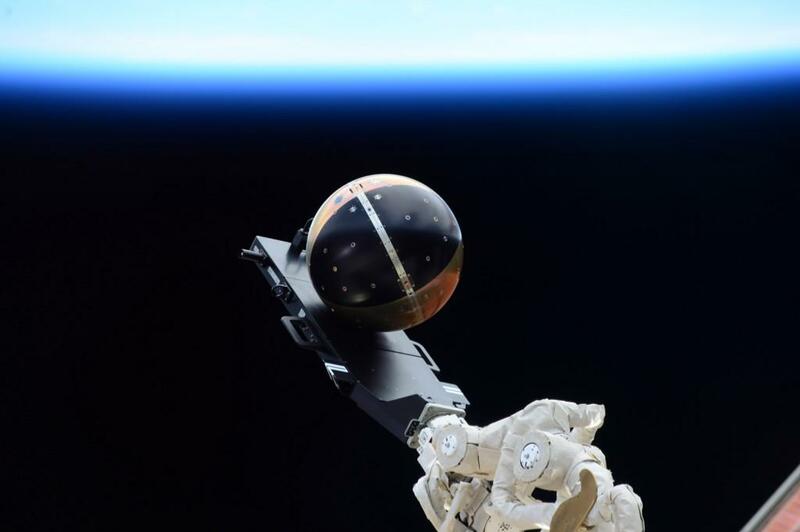 One major experiment released from the ISS this week was the Cyclops mini-satellite. Clocking in at only 22 inches in diameter, the Cyclops propels itself using controlled "micro-thrusters" to position itself. It is busily documenting different facets of space weather (in particular, the atmospheric drag that applies itself to orbiting entities), which is important for the overall assessment of satellite placement and other issues regarding orbital travel. Fly ball! The Cyclops "SpinSat" ventures out to orbit. Another major facet of long-term spaceflight are closed-loop environmental systems, which the space station excels at sustaining. Progress on the ISS this week included important maintenance work on the Carbon Dioxide Removal Assembly, which converts the carbon dioxide exhaled by the astronauts into rebreathable oxygen. It also converts naturally-occurring humidity back into oxygen. 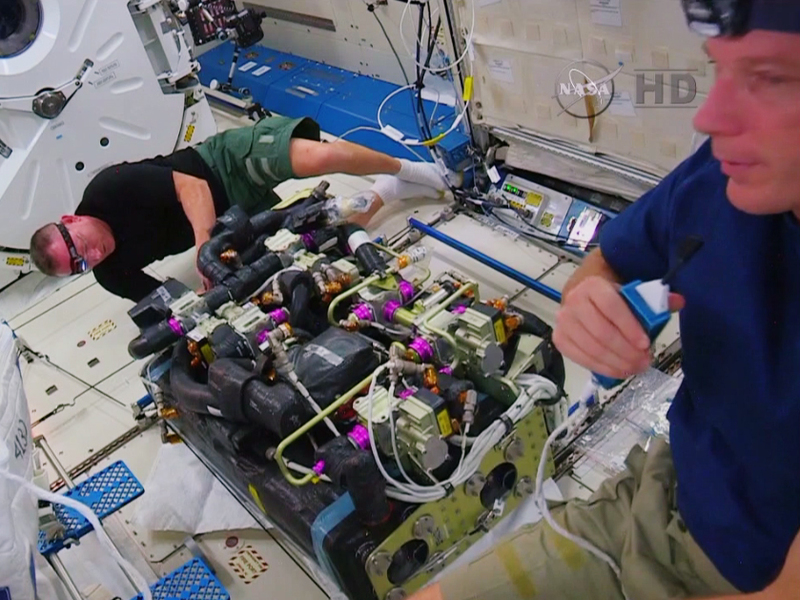 NASA astronauts Butch Wilmore and Terry Virts replaced filters and checked for leaks in the assembly. Basically it serves the functions that a forest would...but needs a lot more upkeep. The 3D printer hummed along as planned, with ESA astronaut Samantha Cristoforetti printing more test parts that could someday be crucial elements for maintaining various functions of the ISS. NASA has even pondered a means to eventually 3D print foods like pizza in space. "Si, it's making stuff. No, unfortunately, not pasta. Yet." 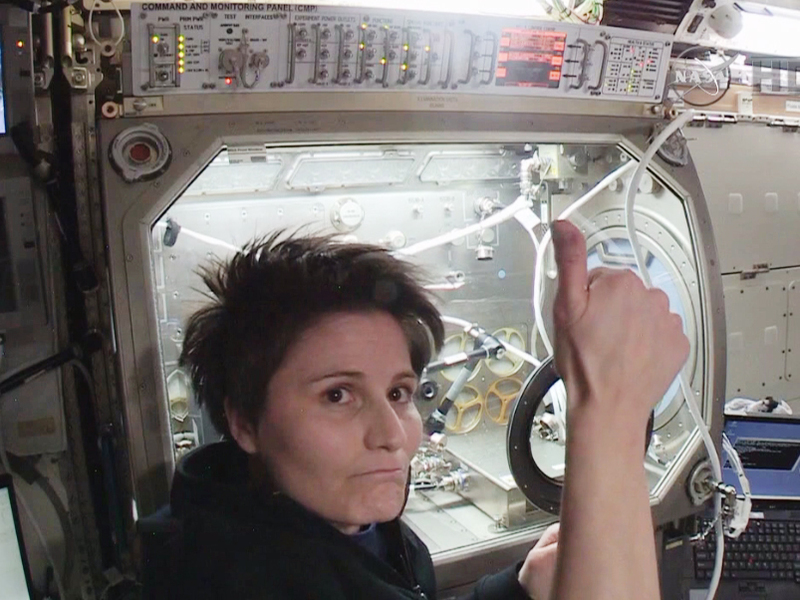 Cosmonaut Yelena Serova worked a host of different jobs in the arts and sciences this week, including installing antivirus programs on ISS computers, working on assessments of blood circulation in micro-gravity, and studying advanced space photography techniques. The Facilities section provides an interior view of the Columbus, Kibo, and Destiny ISS modules, featuring clickable experiment racks that offer details of the science therein. The Benefits section expounds on the topics of how ISS science affects and implements Human Health, Earth Benefits, and Global Education. The Media section offers videos, podcasts, and games, while the Links section offers more ISS analysis sites and connections to other NASA apps. It's a little bit of space, right on your smartphone! The scientific discoveries of tomorrow are floating aboard the ISS today! And, just because it's awesome, here's the Orion launch, one more time. We may not be able to live on the ISS, but with projects like this afoot (overhead? ), it inspires dreams of dwelling even further out in the galactic frontier. See you next week! Watch this space!